Our Halloween dog costumes are a great way to include your pet in the Halloween festivities! These pet costumes are specially designed specifically for your pet's body. All pet costumes are made to be comfortable and adorable. Be sure to select the right size of pet costume. 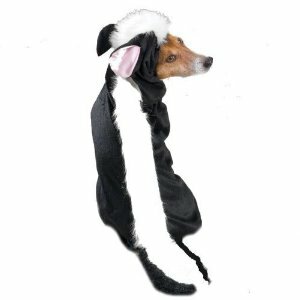 This skunk dog costumes are super fun! It is great for every occassion. Great for photo opportunities, parties, or get togethers. Lil' Stinker costume has adjustable VELCRO® brand tabs that makes it easy to put on and take off. Costumes are made of soft, durable, high-quality fabrics. XSMALL Up to 8" 10"-12" 13"-18"